This is some of the best Coming Soon Under Construction Responsive Templates that help you build a website and notify your potential clients or visitors in advance that you have a blog or website under construction and it is coming soon or going to start soon. 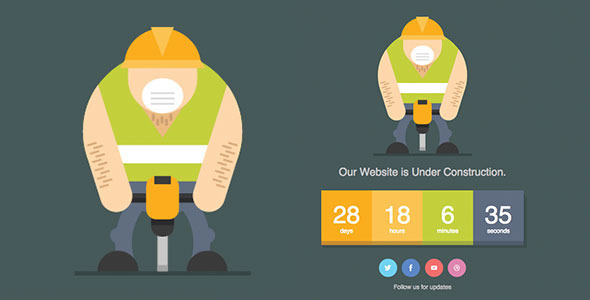 Coming soon or Under Construction page is necessary when website is not ready for launch yet. 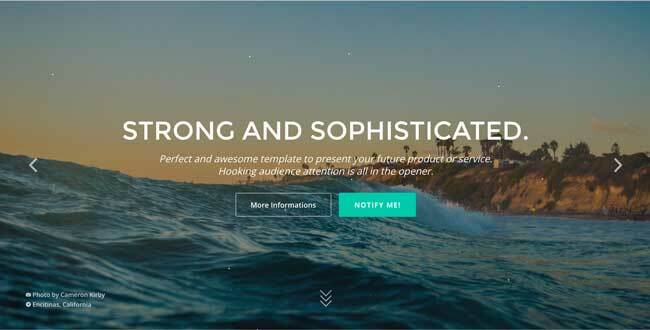 The all Coming soon Page Templates below is the selection based on multiple criteria to create an attractive Coming soon page and links for your users. 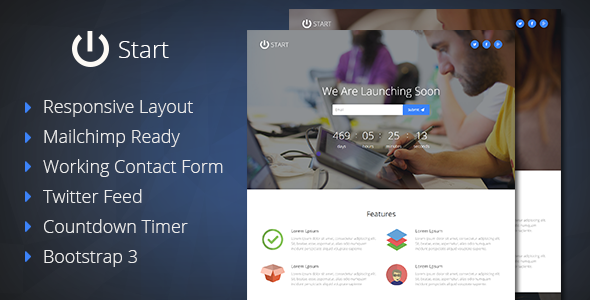 All are fully responsive design and use HTML5 and Css3 technologies, comes with powerful features: Countdown, Contact/Subscription Form, Google Map and more much. 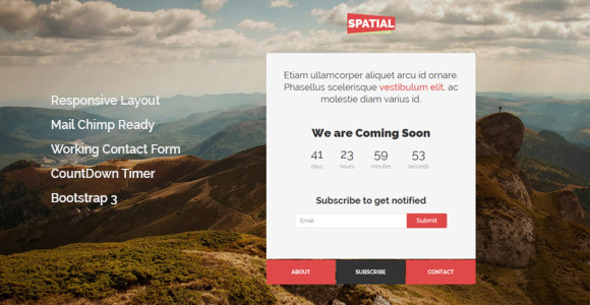 In this article we will show you more than 55 Best Coming Soon Templates and responsive under construction site for your next projects. In addition, we have also introduced a separate set of Coming soon templates with countdown for you. LEGEND is a creative and professional HTML Coming Soon template build with Bootstrap 3 Framework and HTML5 and CSS3 technologies. 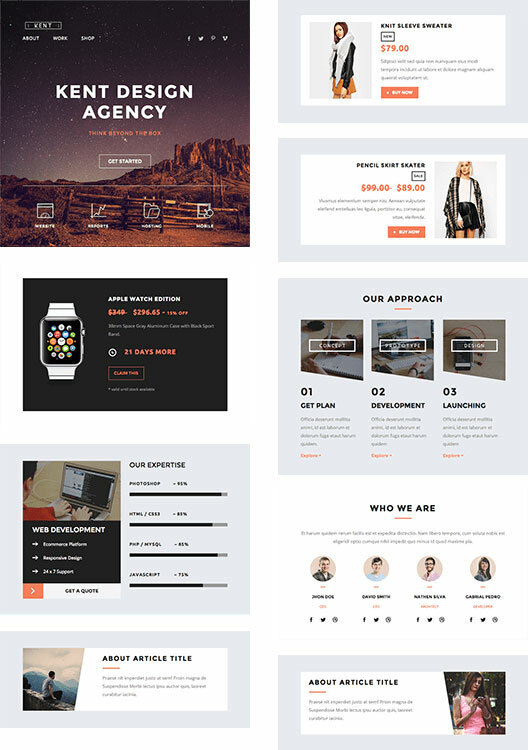 Legend designed with clean and elegant style and SASS and Mailchimp integrated, you can use it for every creative people, corporates, agency, e-commerce, business and portfolio etc… Legend includes 20 demo templates help shorten your implementation time. 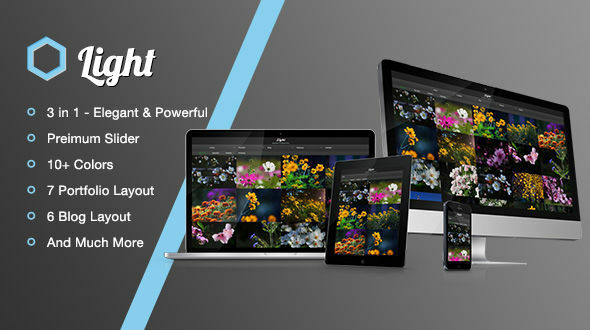 VISION is a responsive coming soon HTML Template valid with HTML5 and CSS3 and mobile friendly. Vision is easily install and customizable with more than 10 sample layouts included. Vision template was built for those who want minimalist coming soon page, and for those who want to display company information until their website is complete. 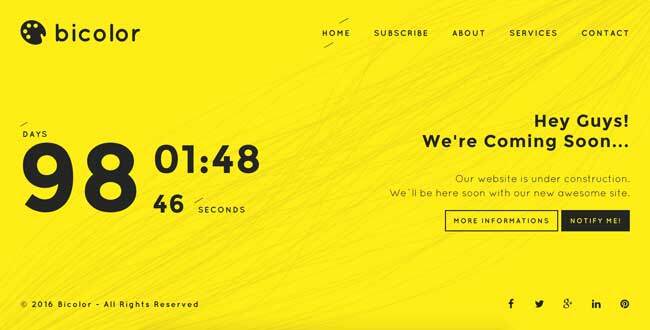 Monarch is a responsive Coming Soon Page Template with modern and clean design. Monarch comes with 18 Styles Variations in 18 HTML files. All pages include popular content layout: About / Team Page, Works Page, Services, Testimonials and Contact Page. Monarch build with HTML5 and CSS3 technologies. Of course, the layout is responsive towards desktop computers, laptops, tablets, and smartphones. Regardless of their device’s screen size, readers can enjoy every well-written article or picture. Opia is a fully responsive and retina ready 3D Parallax coming soon page HTML5 and CSS3 Template. It offers stunning design, really great compatibility and comes with many features such as, Color skins, Contact form, MailChimp integration, Lightbox portfolio, 404 page, Verified code and 60+ icon set. MAGiC is an Universal Coming Soon Page Template with clean and elegant design. Magic Coming Soon Page Template great for Creative people, Corporates, Agency, e-Commerce, business, portfolio etc… MAGiC has been built with the Framework Bootstrap 3, responsive on every screens, easy to customize, HTML5 verified 100% by the W3C, CSS3, SASS and Mailchimp. 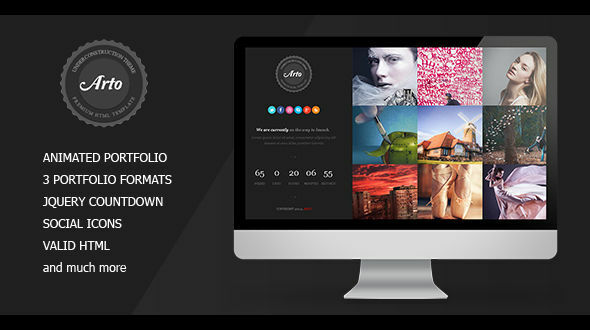 Woody is a responsive coming soon HTML5 template with flat and minimal design. Woody built with Bootstrap 3 framework. It great for a Business coming soon template.Woody easy to use and customizable. Woody includes AJAX subscription, mailchimp ready, working contact form, custom backgrounds and much more! Bicolor is a creative, modern, minimal and fully responsive coming soon, under construction template built with html5 and css3 technologies. Bicolor suitable for every creative people, corporates, business agency coming soon template. 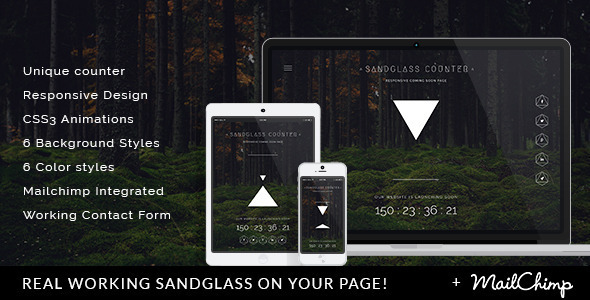 Sandglass is a creative, minimal and fully responsive under construction template. 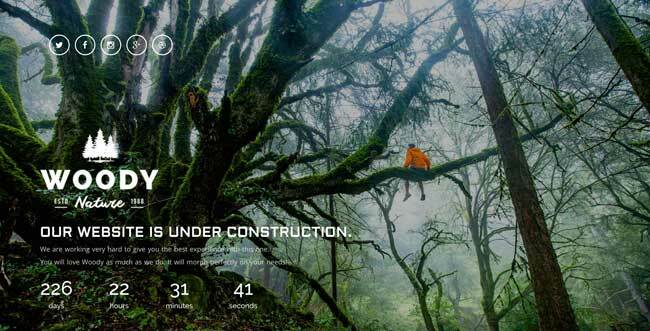 Mountain is a minimal, responsive, business coming soon / landing page / one page HTML5 template. This multipurpose, customizable template, Flat Long Shadows, includes AJAX subscription, mailchimp ready, working contact form, custom backgrounds and much more! 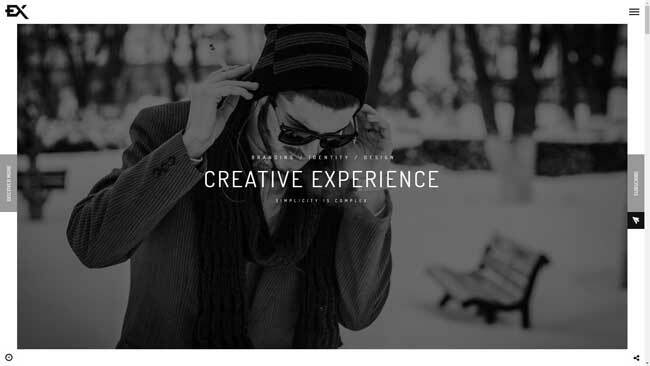 Daniel-Responsive Underconstruction Landing Page. Daniel is designed for temporary usage. You can use this theme for your Landing Page or Coming Soon Page, until the main site is under construction. Angelina is designed for temporary usage. You can use this theme for your Landing Page or Coming Soon Page, until the main site is under construction. 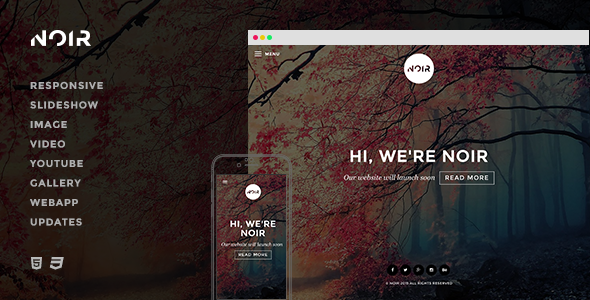 Noir is a html template that tells the world that something is going to happen. The elegant and minimalistic design has been approached with content-first in mind and will seduce your viewers to subscribe. Asa is a creative, modern, minimal and fully responsive coming soon/under construction template suitable for any creative business agency. 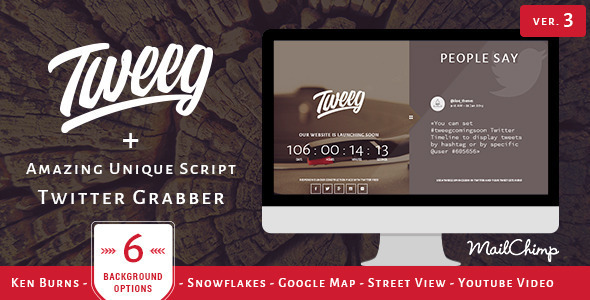 Tweeg is a new, contemporary “coming soon” template tracking trends such a Twitter. 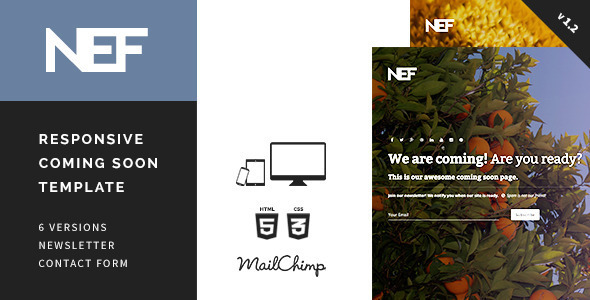 Nef is a responsive template that can be used as “coming soon” and “under construction” page. 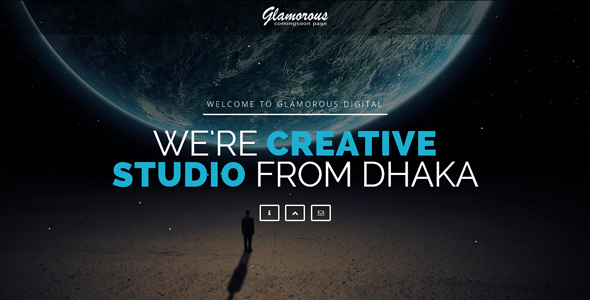 Glamorous is a creative, modern, professional, responsive and HTML5 coming soon template based on latest Bootstrap 3.3 framework . This template is being packed with mailchimp subscription form, ajax contact form, font awesome icons. 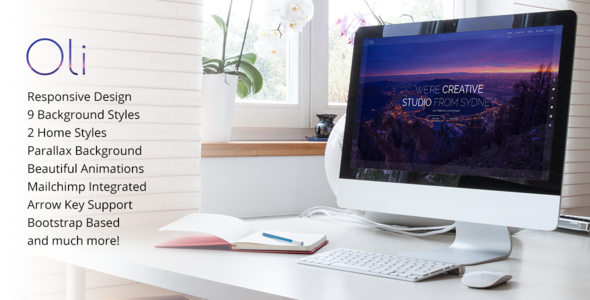 Suitable for any creative agency and personal pages. 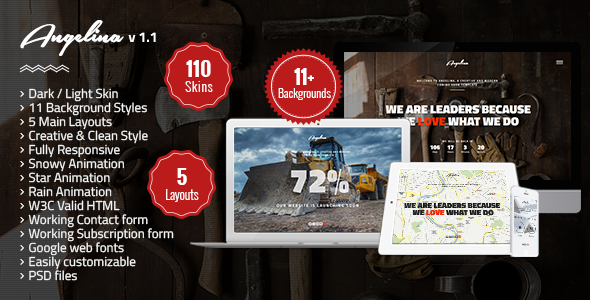 TopLevel – is a responsive Under Construction page. 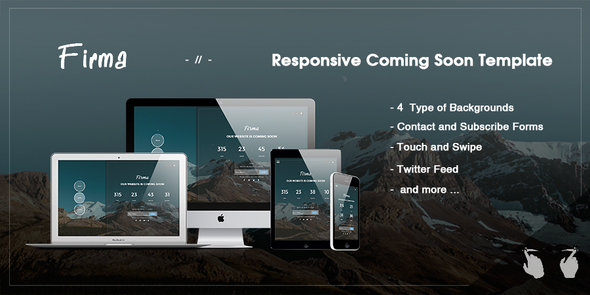 A “Firma – Responsive Coming Soon Template” is perfect if you like a clean and minimalistic design. Spatial has a sharp looking design, and very elegant and classic style. 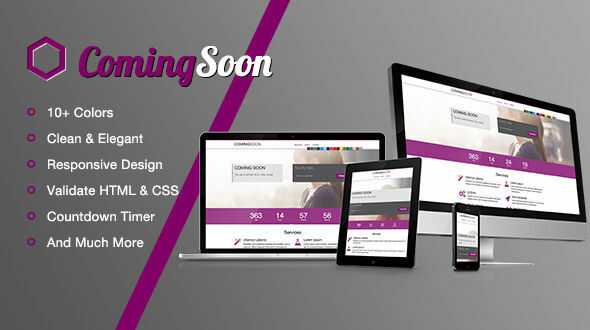 NC – Responsive Coming-Soon Page is Coming-Soon Page. 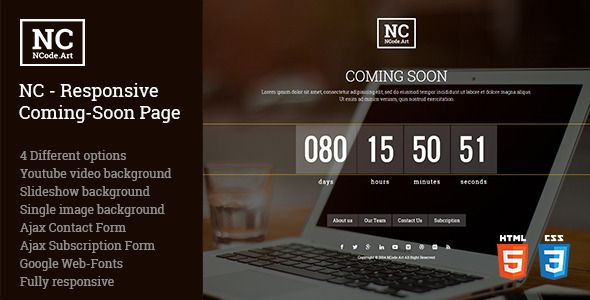 NC – Responsive Coming-Soon Page Build on simple and easily to customize structure. Its helps to introduce website before launching by playing youtube video in background, playing forum/website sideshow. There are also introduction & contact pages available. 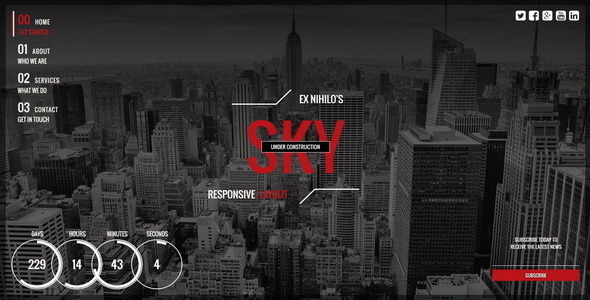 Gravity is the unique and modern coming soon / under construction html template for corporate, agency, photography or general business. 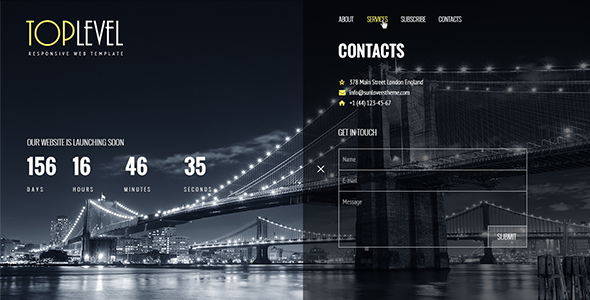 Gravity is a responsive clean Bootstrap 3 based coming soon / under construction template. 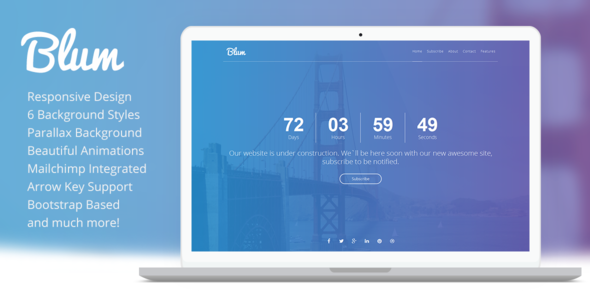 Blum is a creative, modern, minimal and fully responsive coming soon/under construction template suitable for any creative business agency. 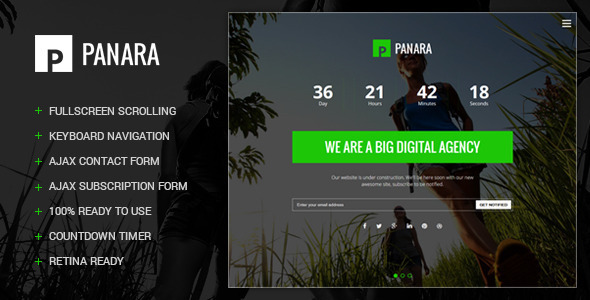 Panara is a creative, modern, professional, responsive and HTML5 coming soon template based on clean code. This site template has 2 design styles. 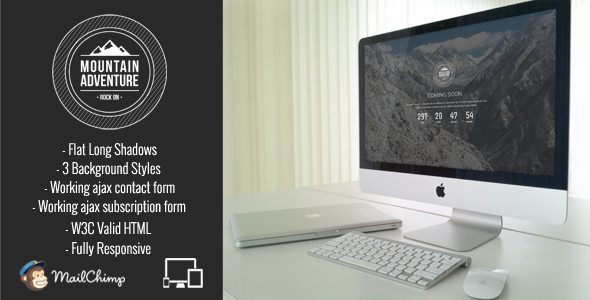 This template is being packed with ajax subscription form, ajax contact form, font awesome icons and many more. 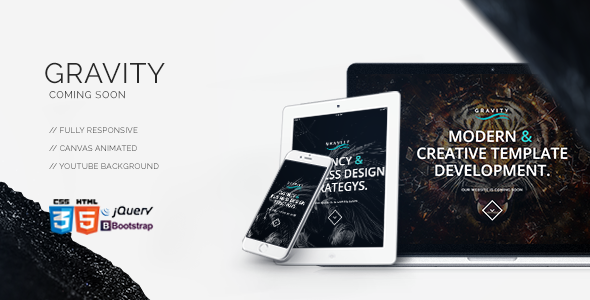 Dynasty is a Responsive HTML5 and CSS3 under construction template. 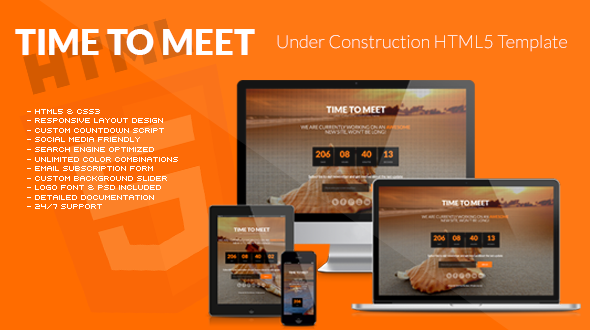 Time to Meet is a responsive under construction, coming soon page responsive HTML5 template. 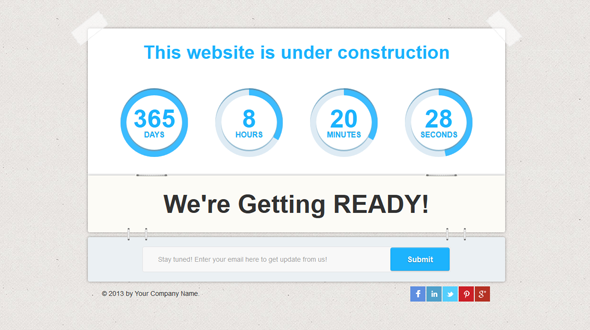 This theme suitable for landing pages, under construction, coming soon or small businesses sites. This template comes very special theme options panel and you can control countdown script, color schemes, social media profiles and more. If you are looking professional WordPress Under Construction theme, the Time to Meet ideal for you. 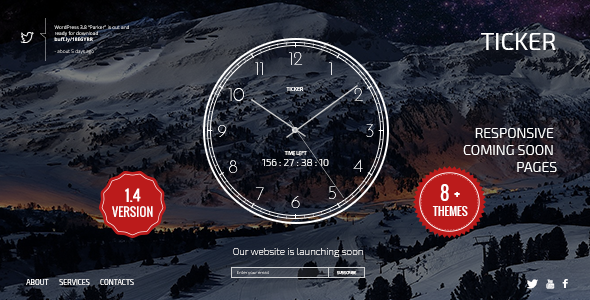 Simple jQuery countdown to website launch. 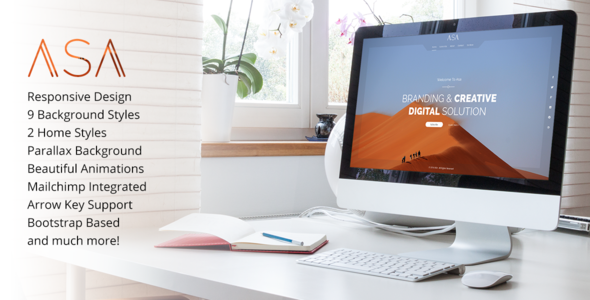 Easy to setup, perfect for colourful websites. You are currently working on a new site? 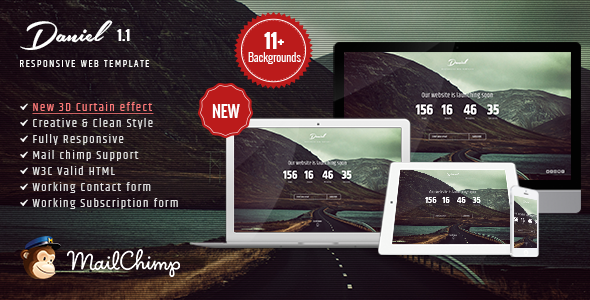 We’ve designed a very cool responsive template with a countdown and a fullscreen background slider. While your site or product is underway, use the included newsletter form to collect prospective customers and visitors with MailChimp e-mail newsletter form. The template is ready-to-go and has features amazing background slider, custom portfolio sections (filterable), countdown module, social media and SEO friendly, super awesome lightbox plugin and much more.. 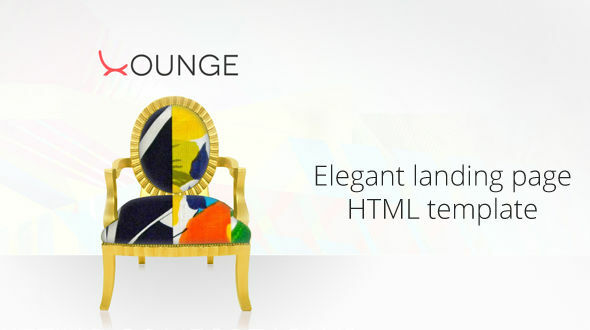 Lounge is a minimalist, modern coming soon HTML page fit for your next awesome project. This is coming soon page.But, you can use this template as landing page too.Because, Glance Template has sticky nav menu, a subscription section with description and error desktop animations, a services section with service buckets, a realtime tweet system..This template is created Twitter Bootstrap and enhanced Jquery.Well Documented and Responsive. 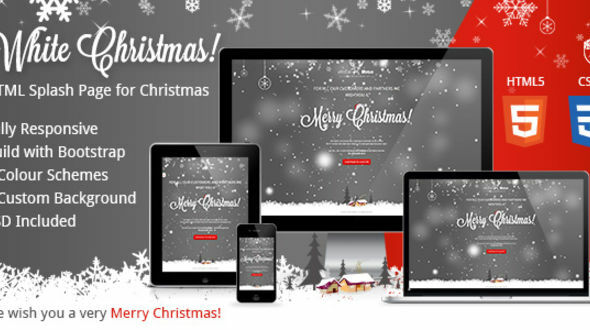 White Christmas is responsive HTML splash page for your site and an easy way so say Merry Christmas. The template comes with 5 colour preset style and 1 custom image background. 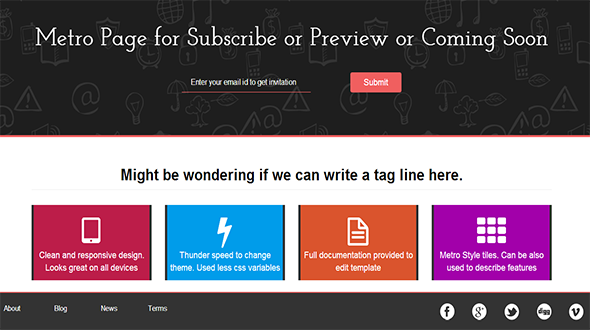 All this are written in separate documented css files for easy customization. The template is based on bootstrap framework and is adapting to any device (desktop, tablet, smartphone). 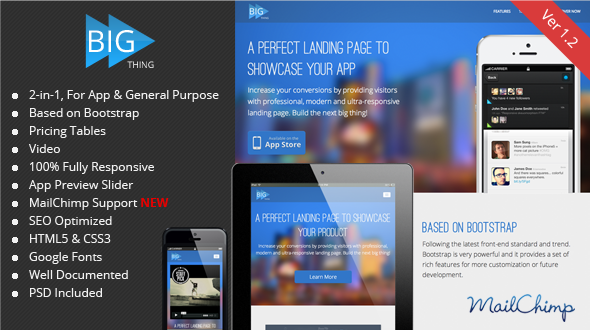 Sell your App, Promote your subscription service or other general products with BIG Thing Landing Page. Built with “Content First” design concept, BIG Thing will provide full benefit for your business, both content accessibility and responsive design aspect. Following the latest front-end framework, Bootstrap, surely BIG Thing allows you to align with the current modern website. BizComing is a clean, professional coming soon page template. It’s full responsive and scales for ANY device. BizComing will perfectly fit to any type of business. 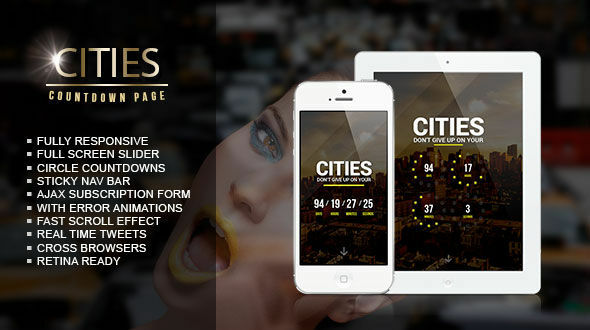 This is good solution to start every kind of websites.Cities Coming Soon Page has countdown,tweet system,full page slider and AJAX Subscription System.Retina Display Ready.Well Documented and With All of PSD Files. 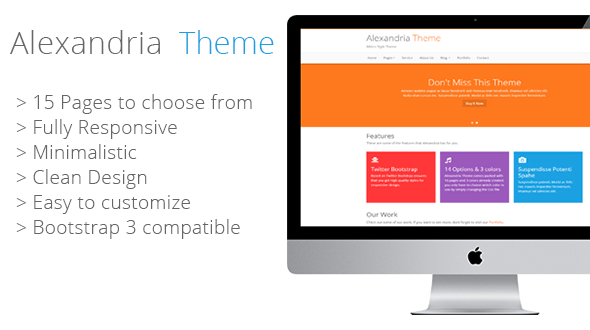 Alexandria is a clean fully responsive Professional all in one theme built using bootstrap 3, so you get a fully tested design. You will get 15 pages and 3 colors (Dark, Orange, Light Blue) ready to use, all you have to do is change one line of code and thats it, you’re ready to go. First thanks you so much for interested or purchased our HTML5 template. The F&H is a highly quality, creative and minimal HTML5 wedding template for your landing pages, under construction & coming soon pages. This template comes unique overviews like; beautiful fonts (based on Google, 700+ awesome font icons, custom countdown script, sweet photo slideshow, responsive layout design and much more. 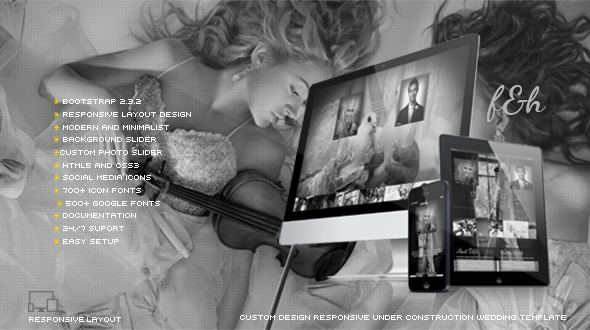 The F&H is an best under construction templace created in Bootstrap 2.3.2, jQuery, HTML5 and CSS3. 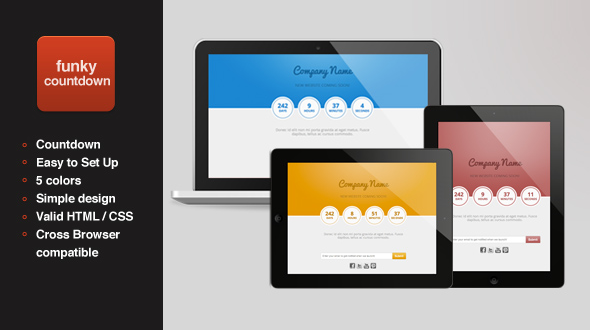 This template is compatible with all mobile devices (phone, tablet etc). Metro Page is a responsive full screen coming soon page which is simple, beautiful and perfectly fits for an upcoming site or mobile app. It is the Perfect template for creating an under construction page for an upcoming site or product and begin collecting subscribers before the launch. 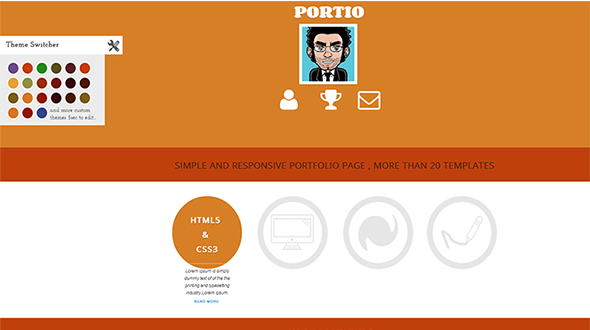 PORTIO is a simple and responsive bootstrap based portfolio theme and has more than 20 templates. 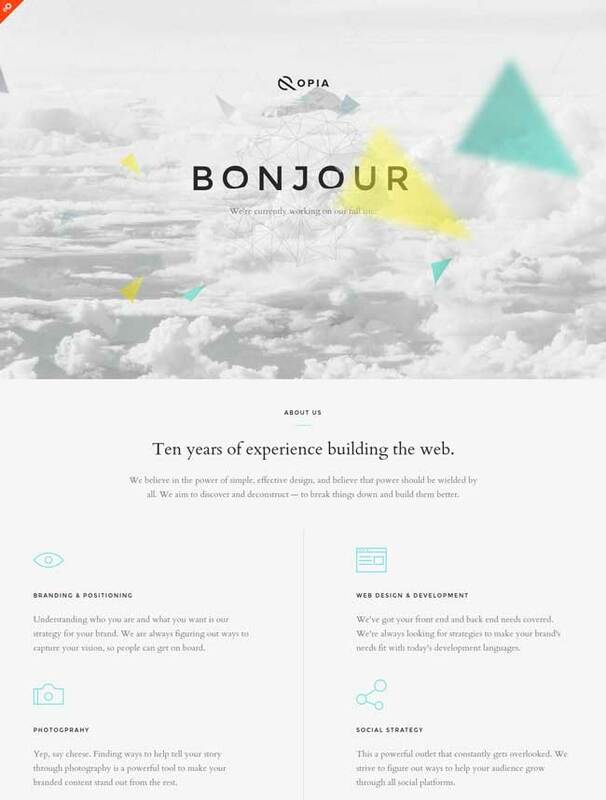 Pisunok is a template with responsive design. Pisunok comes in two layouts – left-sided and right-sided and has two preinstalled color schemes – dark and white. You can change easily color and fonts. It has simple page structure and easy to use APIs (google maps, google fonts etc.). This template has fully working ajax subscription form and contact form. 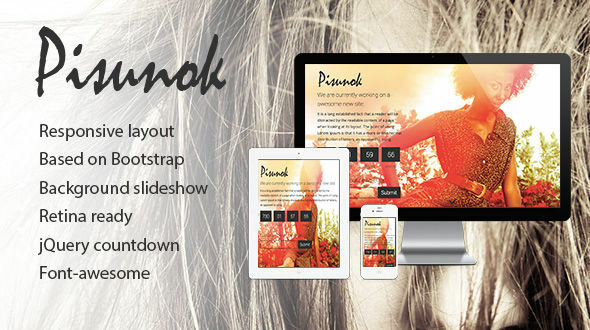 Pisunok perfectly suitable for any creative, business website other under construction or landing page theme. The F&H is a highly quality, creative and minimal HTML5 wedding template for your landing pages, under construction & coming soon pages. 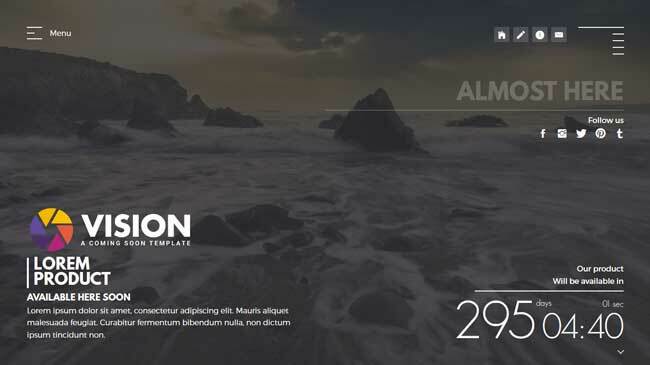 This template comes unique overviews like; beautiful fonts (based on Google, 700+ awesome font icons, custom countdown script, sweet photo slideshow, responsive layout design and much more. The F&H is an best under construction templace created in Bootstrap 2.3.2, jQuery, HTML5 and CSS3. 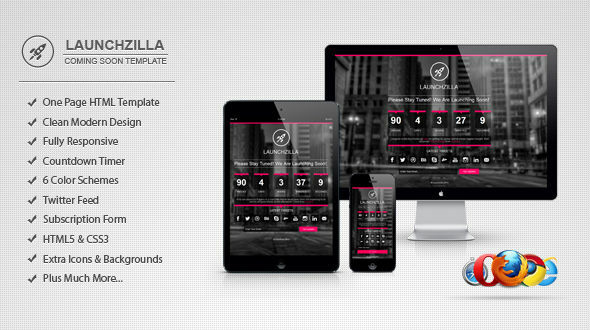 This template is compatible with all mobile devices (phone, tablet etc). Great news! 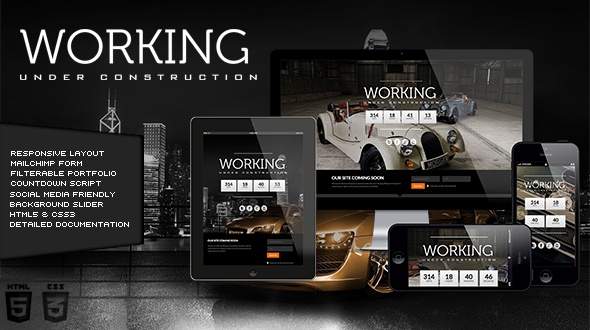 A lot of new design trends for Coming Soon, Under Construction Template 2016 are added, we hope you will like it!